Cirque du Soleil is back in Columbus with its big top show: KOOZA! KOOZA is a return to the origins of Cirque du Soleil: It combines two circus traditions - acrobatic performance and the art of clowning. Between strength and fragility, laughter and smiles, turmoil and harmony, KOOZA explores themes of fear, identity, recognition and power. The show is set in an electrifying and exotic visual world full of surprises, thrills, chills, audacity and total involvement. The show runs June 4 through July 5 under the iconic blue and yellow Big Top located on W. Mound Street, at the future home of the Sports Pavilion & Automotive! Don't miss KOOZA! Exclusive KidsLinked Special Offer: KidsLinked readers receive special access to a Family Four Pack Offer! This saves you 20% off tickets when you buy 2 adult and 2 child tickets. This offer is good for all shows on price levels 1, 2 and 3. There is a maximum of 8 tickets allowed. Get Your Family's Tickets NOW! 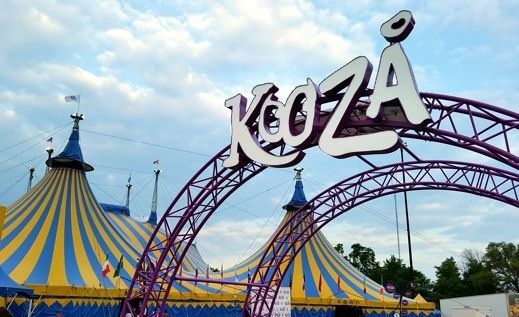 Last week I was fortunate for the opportunity to attend the North American premiere of KOOZA by Cirque du Soleil, presented in the Grand Chapiteau raised on the Sports Pavilion & Automotive Research Complex (SPARC), site of the former Cooper Stadium. I wanted to check out this year’s touring production to be able to share some insights with families who may be curious about the show. So, what does ‘KOOZA’ mean? According to Cirque du Soleil: “The name KOOZA is inspired by the Sanskrit word ‘koza’, which means ‘box’, ‘chest’ or ‘treasure’, and was chosen because one of the underlying concepts of the production is the idea of a ‘circus in a box’.” The totally immersive 1-ring/stage circus is far from traditional, and you will likely be sitting closer to the action than you would at any 3-ring circus in a large venue. The semi-circular seated audience of 2,600 seemed to be 20% - 25% “18 and unders”, and the children sitting around me were mesmerized, roaring with laughter. The show is very interactive, and the performers often end up in the aisles, before and throughout the show. Several surprised audience members found themselves on stage (some, in mildly compromising positions! ), so sit nearest the stage at your own risk. A little boy at the end of the row in front of me got quite a surprise when a clown lifted the tike from his seat! An upside of closer seats is the ability to relish the perfection of detail in costuming and makeup. You’ll be close enough to get blasted by confetti cannons, see poofs of resin billow up, and spot the occasional sequin whizzing from a spinning body. The uniqueness of the Cirque blueprint is the complex, underlying theatrical story which carries the audience from acrobatic to death-defying act. This journey is led by sweet little character with whom kids will identify from the get-go. With his sad little kite that won’t fly and his shy, wide-eyed wonder; “The Innocent” traverses KOOZA’s self-described “zany kingdom”, transforming with ever-swelling self-confidence and stature as he meets and witnesses the feats of its dwellers. The focus of this show is the return to Cirque du Soleil’s roots in acrobatic perfection and the art of clowning. I’ll admit I wasn’t necessarily excited about “clowns” per se; but rest assured, these clowns are more along the lines of eccentric, capricious artists in elaborate costumes and make-up who push the tale along. There is lots of wacky slapstick humor, but no packed mini-cars or squeaky red noses here. The live band and singers, high above the stage in their intricate tower, drive the show with exotic to pounding rock beats. The acts are also far from ordinary. Unabashed professionals fly mere yards above your head with the nail-biting trapeze, high wire, and wheel of death performances on structures precariously perched on the small set; while acrobats and ridiculously flexible contortionists grace the stage with ballet beauty and fluidity. Unusual acts such as the “dancing” unicycle couple, synchronized contortions, and impeccable hula hoops twirling may just entice your kids to want to run off and join the cir....que du soleil! • Children under the age 2 are admitted free of charge, but must remain seated on a parent’s lap. Tickets must be purchased for children over age 2, whether or not they occupy their own seat. Children must be seated next to an adult. • Price Points: Regular tickets range from $38/Adult and $28/Children 2 to 12, to a Behind-the-Scenes VIP Package for $495. • Attire: Dress-casual to dressy. The show takes place in a climate-controlled enclosure. • Seating: Grand Chapiteau seats over 2600 in a semi-circle. There are stadium-style folding seats, tightly situated with no armrests, on low-angled risers in fairly close rows. Deep, padded boosters are available for kids. Due to the low vantage point of the audience, a tall person in front of an adult might even make it a little difficult to see. - Some sequences with loud, ominous music, coupled with costumes, intense lighting and acrobatic performances. *I observed a parent putting their arm around a young child when the wheel of death segment began and stage personnel emerged in skeleton costumes. Shortly into the segment, the child did not seem to be scared.